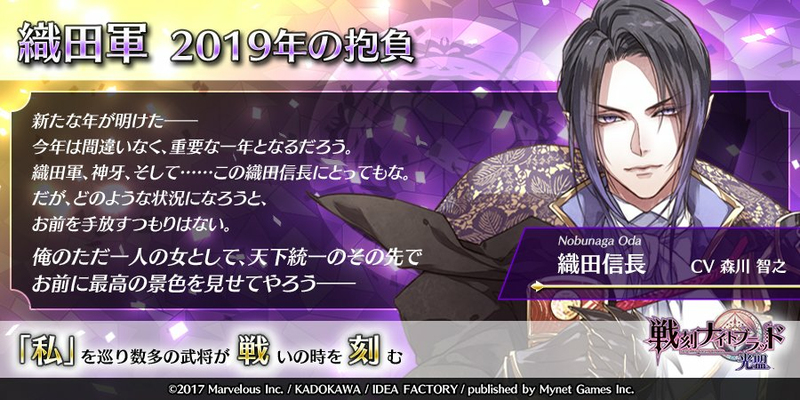 This entry was posted in Collaboration, Otome Games, Sengoku Night Blood and tagged Kadokawa, Marvelous!, Mobile, Otomate, SNB Nobunaga. It’s similar to last year’s message but with the exception of outright declaration of being his partner makes it feel the vice grip of remaining at his side tighter than ever before 😮. We’re not going home are we? I was a bit disappointed because it was so similar when everyone else had pretty different ones, but on second thought it suits him a lot |D It’s short, sweet, and to the point.